Redbox Contest Prize: Year Of Free "Movie Nights"
The DVD/Blu-ray movie rental company Redbox launched a new contest that began today. The prize in the contest is one free year of “Movie Nights.” The year of “Movie Nights” includes 52 (one for every week of the year) promo codes for a free movie rental from a Redbox vending machine. To participate in the sweepstakes, entrants must send a text the word ‘fun’ to 727272, from today through April 30, 2012. The “Movie Nights” promo codes are good until June 30, 2013. 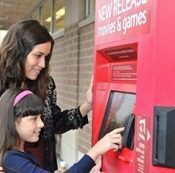 According to Redbox, entrants may enter the contest as often as once per day, and they are giving away new prizes every day – so there will be 30 winners in all. Entrants may also join Redbox’s Text Club by responding with a ‘y’ when they receive their confirmation text. Members of the Redbox Text Club receive one free monthly promo code per month. Redbox says they will notify winners by May 30, 2012. In the comments section, Helen let us know that the above link, provided by Redbox, does not go to the online entry form. I do not have a cell phone and can not find anywhere on your site redbox.com/mobilesweeps to fill an entry form. Where can I find the form?